A series of rumors, leaks, and hints all indicate that Google will launch its “real-time” or “streaming” search engine today. Google’s mysterious press event is still hours away, but it seems the details are starting to leak. According to several sources, Google’s rumored (and revealed) “streaming” or “real-time” search engine, which shows automatically updated results with each letter typed, has already hit the Web. Many searchers reportedly have access to the engine already, and at least a few videos are now online showing off the streaming service. Does this mark the end of the “Search” button? In the above leaked clip, results are shown popping up with every key stroke, as expected. An X now appears in the search box, allowing users to cancel a search à la OS X Spotlight, and “I’m Feeling Lucky” now appears beside each drop-down result. The “Search” button remains, but it now sits next to an option for turning streaming search on or off. If these leaks aren’t enough to convince you of what Google has in store for its announcement, the search-giant also dropped a bit hint today on its homepage in the form of an interactive logo. 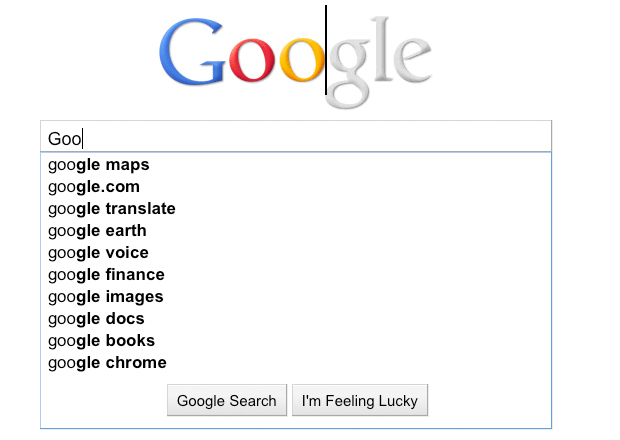 With each key typed in the search box, the letters of a grayed-Google logo automatically begin to fill in with color–a cursor even hops along for extra effect. Sounds familiar, right? And these rumors and hints fit in perfectly with a new Google Labs product called Google Scribe, which surfaced this morning. 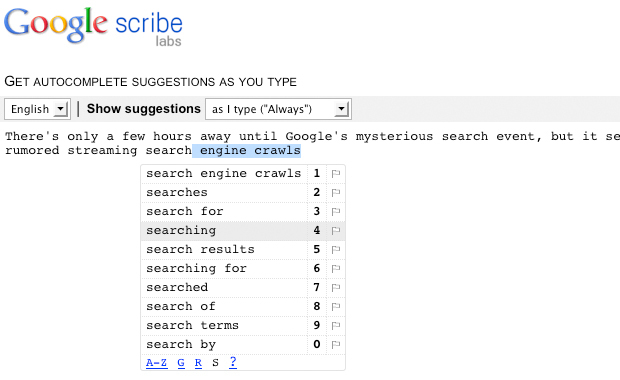 The application is essentially a text document that offers “autocomplete suggestions as you type.” When users type a few letters, a numbered-list of suggestions pops up. It won’t just help complete a word but whole phrases–as you type “streaming,” suggestions offered include “streaming video,” “streaming music,” or “streaming quotes are available.” All options can be sorted alphabetically, by “Scribe score,” relevancy, or from one’s search history. All these leaks point to Google launching its streaming search engine today. But it’s possible Marissa Mayer has something else in store for us as well. Google’s press conference begins at 12:30 Eastern, and it will be streamed live. Anyone have access to the real-time search service yet? Drop us a line with details or let us know in the comments.